Several students in Randolph College’s Master of Arts in Teaching (M.A.T.) 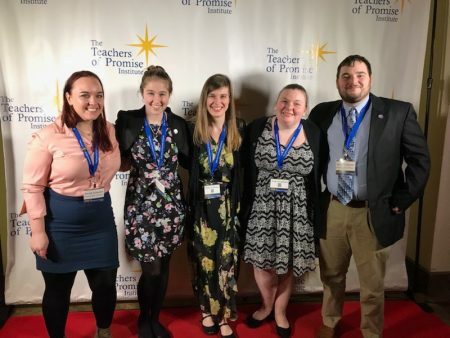 program were named Teachers of Promise by the Teachers of Promise Foundation during a gala at Virginia Commonwealth University on Friday, March 2. The honorees were Ryan McDonald, Evie Rigby Goodson, Sarah Grissom, Jennifer Sanborn, and Molly Williams. Each student is a candidate for May 2018 graduation. Founded by a fourth generation public school teacher in 2010, the Teachers of Promise Foundation was established to support the work of individuals, organizations, and teams who seek to discover, identify, celebrate, and encourage high calibre teachers-to-be.